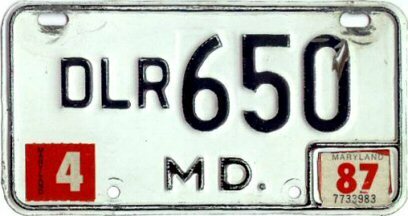 This page covers the history of various types of Maryland license plates issued for motorcycles. 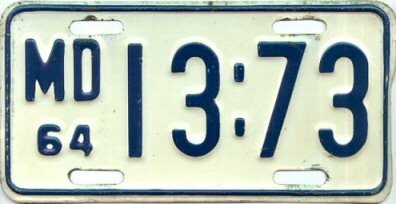 January 21, 2019 – Replaced photo of someone else's sequentially-numbered 1982-87 historic motorcycle plate with that of one I've added to my collection. October 3, 2018 – Replaced photo of someone else's 1983-84 State Police motorcycle plate with that of one I've added to my collection. 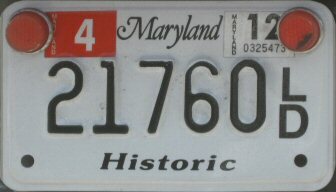 From 1910 to 1937, Maryland license plates displayed the calendar year in which they were valid. Plates dated 1939 and later always indicate, on the plates themselves, or via metal tabs or stickers, the year in which they expire. Exceptions to this include undated, unstickered plates that expired in 1976 and 1981. I consistently refer to plates by the year that is shown on the plate, regardless of when the plate was actually issued. Between 1939 and 1986, motorcycle registrations expired annually each March 31. In some years, the expiration month, or month and day were indicated, at other times only the expiration year was shown. Beginning October 1986, motorcycle registrations can expire in any month. Two-year registration periods were phased in during the early 1990s for motorcycles owned by individuals, and during the late 1990s for those owned by businesses and organizations. Two-year registrations have now become virtually mandatory. 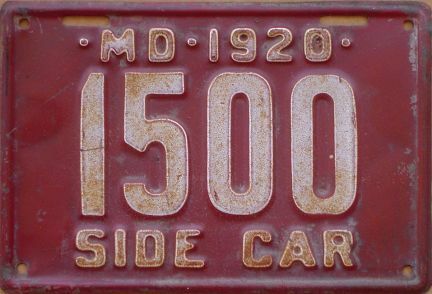 Maryland motorcycle plates have usually closely resembled their passenger car equivalents from the same time period. 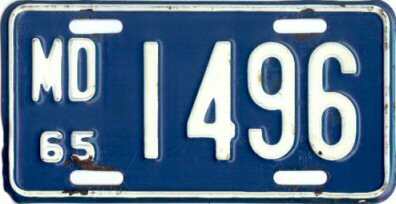 Since 1972, motorcycle plates have been renewed with the same stickers as passenger plates. Because this information is covered in detail on the passenger car plate pages and the general information page, I'll just point out when there were significant deviations from passenger car plates. 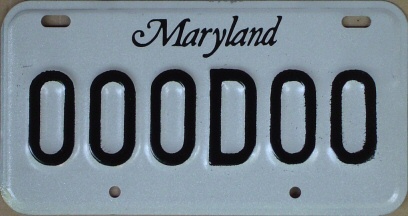 Note that this page does not exhaustively cover all types of Maryland motorcycle plates. 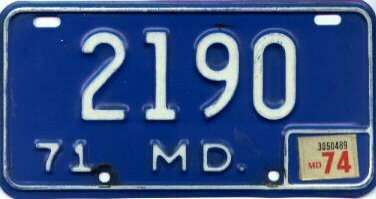 Plates for police motorcycles are covered on the History of Maryland Emergency Vehicle Plates page. The serial number of this 1911 motorcycle plate is "55", with one digit stacked above the other. Much of the second digit is obscured by damage to the porcelain. 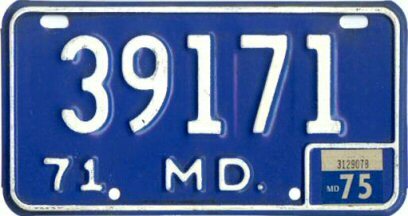 Maryland state-issued motorcycle plates were reportedly introduced in 1910, the same year as passenger car plates. 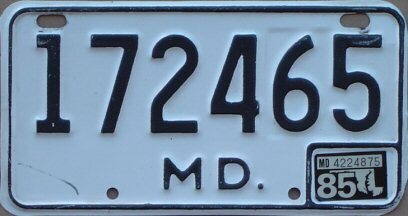 Most unfortunately, no surviving examples of 1910 Maryland motorcycle plates are known, and no details are available. 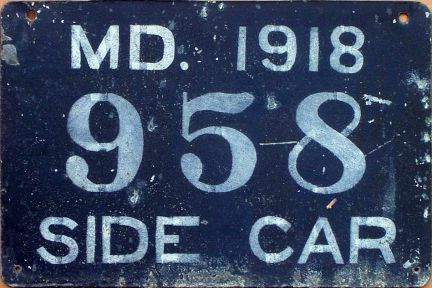 During the years 1911, 1912, and 1913, Maryland motorcycle plates were porcelain-coated, were very tall and narrow, and were curved from top to bottom. They were designed to conform to the shape of the rear fender of the vehicle. 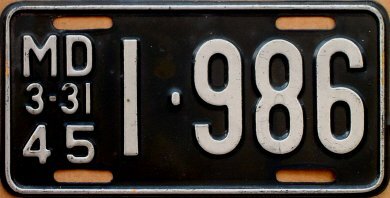 The 1913 plates were also curved from side to side as well. For all three years, the registration numbers were stacked vertically, one digit above the other. Plate colors matched the passenger car plate colors. Very little is known about early motorcycle dealer plates, but reportedly they existed as early as 1912. The 1914 motorcycle plates were still made of porcelain, but took on a more conventional appearance. They were horizontally oriented rather than vertically, and they were no longer curved. Beginning in 1915, motorcycle plates were made of steel, but they remained flat (not embossed) through 1920. Colors matched those of passenger car plates. 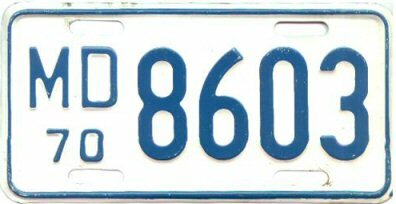 These plates reportedly existed, but no details are available. Side cars were apparently registered separately from the motorcycle to which they were attached. The exact range of years is not known, but includes 1918 through 1927. These plates were small and approximately square shaped; they bore the legend Side Car along either the top or bottom edge, depending on the year. The 1918 plate shown above is completely flat, and it's evident that the white text and plate number were hand-painted using stencils. It measures 9 inches wide by 6 inches high. The 1920 plate, and I believe subsequent years as well, is embossed. This plate measures 9 inches wide by 6-1/8 inches high. 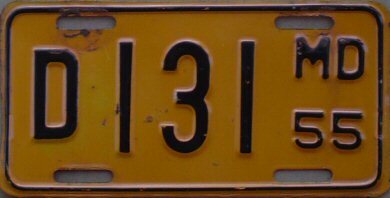 The side car plates are shown in proportion to the motorcycle plates. I don't know what 1919 side car plates look like. See the ALPCA Archvies for more details. 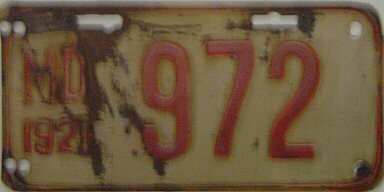 Note that the 1922 plate has apparently been repainted, and the 1935 plate is badly discolored; it should be dark blue characters on a white background. 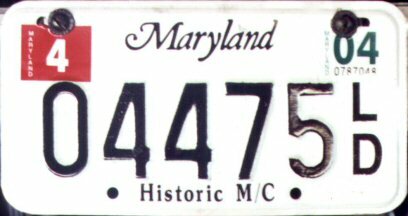 Beginning in 1921, Maryland motorcycle plates were embossed and displayed a four-digit year. 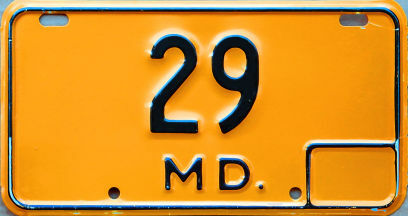 The abbreviation MD was stacked over the year, either on the left or right side of the plate. Usually the location of these elements alternated from one side to the other each year, but not always. Also beginning in 1921, an embossed dot separator was located between the third and fourth digits from the right, for four-digit serials. Again, colors matched passenger car plates. It's evident that sometime during the 1920s, and again during the 1930s, the bolt slots and holes were relocated. Side cars were apparently registered separately from the motorcycle to which they were attached. The exact range of years is not known, but includes 1918 through 1927. These plates were small and approximately square shaped; they bore the legend Side Car along either the top or bottom edge, depending on the year. See the ALPCA Archvies for more details. 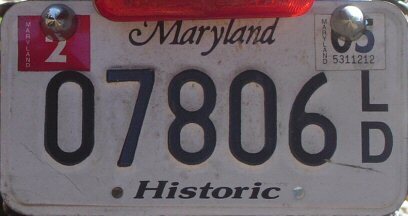 In 1938, Maryland converted from calendar year registration periods to annual registrations that expired each March 31. At the same time, the state began putting the expiration date rather than the issue year on their license plates. 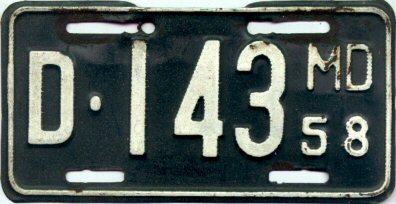 For motorcycle plates this practice continued through the 1953 expiration plate. 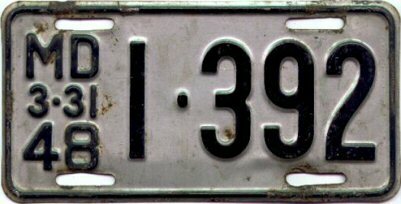 The plate issued at the start of 1938 was valid for 15 months; since it displayed the expiration date of 3-31-39, there were no plates issued with the year 1938 indicated on the plate. 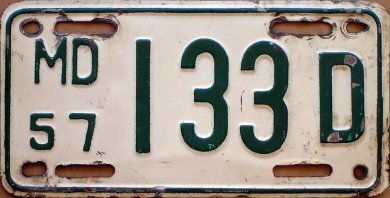 During the years when passenger car plates were renewed with metal tabs, motorcycle plates continued to be issued annually; however, in these years the motorcycle plate colors sometimes deviated from the passenger car plate colors. An embossed dot separator continued to be used on four-digit plates, between the hundreds and thousands digits. 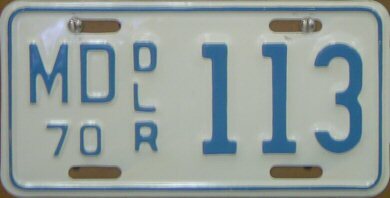 These plates resembled regular motorcycle plates, but the serial number consisted of a small "D" prefix, followed by a one- or two-digit number. Obviously, they were produced in small quantities. Beginning with 1954 expiration plates, the expiration month and day were dropped, although motorcycle registrations continued to expire annually on March 31 of the year indicated on the plate. At the same time, the serial separator was moved to a position between the second and third characters from the right. 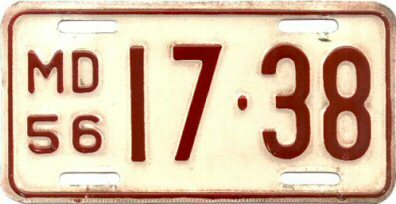 The plate colors once again consistently corresponded to passenger car plate colors each year. However, the serial separator did not correspond to the various separators used on passenger car plates during this time. Separators were dropped altogether beginning with the 1965 expiration plate. Motorcycle plate diminsions during this time period were 4 1/8 inches by 8 1/8 inches. 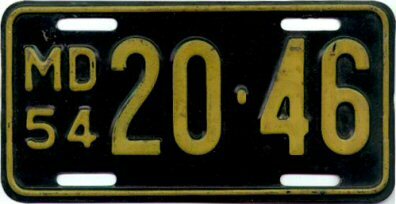 As far as I know, motorcycle plates always had four-digit serial numbers during this time, and lead zeroes were not used. But in the latter years of this period, the four-digit all-numeric format was exhausted, and formats x000 and 000x were also used. 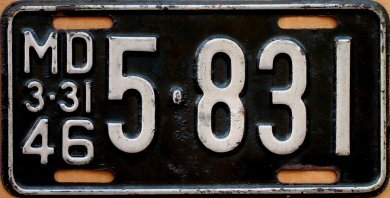 Serial dies were changed for the 1967 expiration plate; this is most evident by comparing the numbers 1, 6, and 9 on late 1960s plates to those of earlier plates. The state and year dies were changed several times during this period. These plates closely resembled regular motorcycle plates. 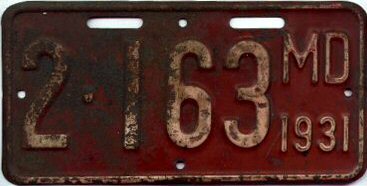 However, you can see that at least in the case of the 1958 dealer plate, the state abbreviation and expiration year were on the opposite side of the plate than they were on regular motorcycle plates, and the separator character went between the small "D" prefix and the first digit. 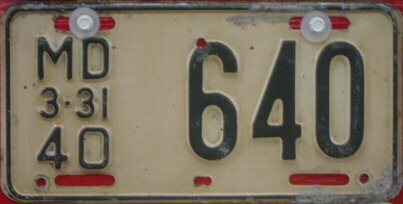 The 1955 and 1957 dealer plates had the state and year on the same side as regular motorcycle plates, but had no separator character. 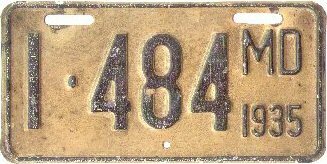 I have no information about what the 1954 or 1956 dealer plates looked like, other than that they also had the same small "D" serial prefix or suffix. 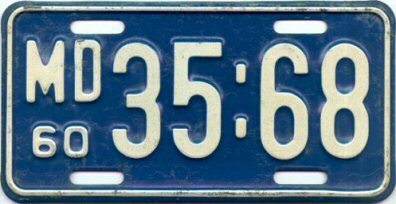 From 1959 through at least 1964, the state name and year stayed on the same side as regular plates, the serial consisted of an even smaller "D" prefix followed by a three-digit number, with the separator between the second and third characters. 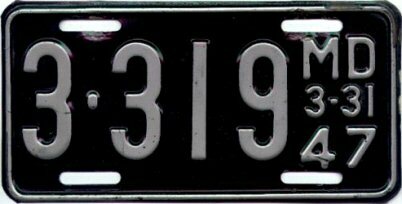 Note, however, that the 1960 plate uses a diamond separator character, the same as on full-sized plates of that year, but different from the colon used on regular 1960 motorcycle plates. 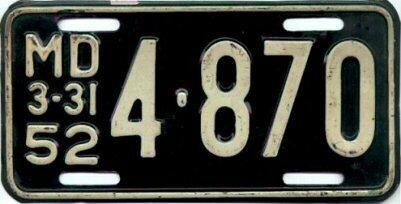 I can't tell you which separator characters were used on motorcycle dealer plates between 1961 and 1964. I don't know for sure what 1965 and 1966 motorcycle dealer plates look like. Probably the separator was dropped like on other plates. 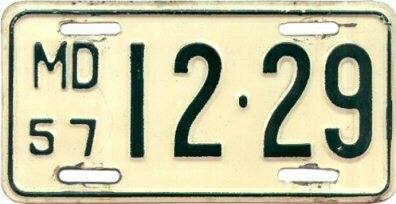 By then, regular motorcycle plates exhausted the all-numeric format and were issued with a full-sized letter in either the prefix or suffix position. I've seen full-sized "D" prefixes and suffixes as well as other letters. I've never seen a 1965-1967 plate with a small "D". Joe Sallmen tells me that 1967 motorcycle dealer plates do have a full-sized "D" – he's got one, along with the registration card indicating that it's a dealer plate. 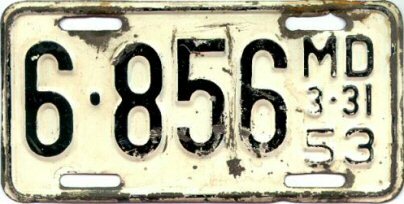 So it's entirely possible that 1965 and 1966 motorcycle dealer plates also had a full-sized "D", but it would be impossible to know for sure without a registration card to go with the plate. 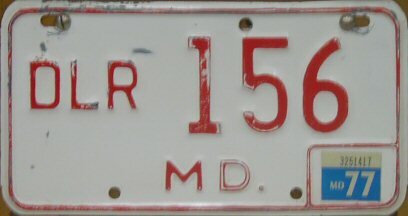 Starting with the 1968 plate, to once again clearly distingush dealer plates from regular motorcycle plates, the legend DLR, stacked vertically, was embossed on the left center portion of the plate, just to the right of the state abbreviation and year. 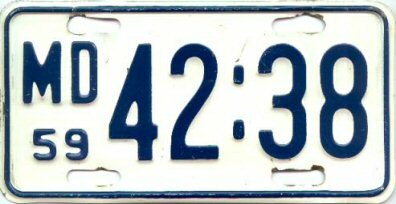 A three-digit serial number occupied the right half of the plate. This format continued through 1970. 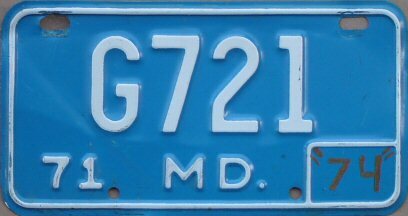 Similar to passenger cars, beginning in March 1970 motorcycles were issued white-on-blue base plates with an embossed 71 expiration year in the lower left corner, and a sticker box with an embossed border in the lower right corner. Of course, there was only room for the state abbeviation MD., which was located at the bottom center. The serial dies were made shorter than in previous years to accommodate these features along the bottom of the plate. The lower bolt holes were also moved inward to provide a place for the renewal sticker to go. Plate dimensions were 4 1/2 inches by 8 1/2 inches; these bolt hole locations and plate dimensions continued unchaged through 2008. 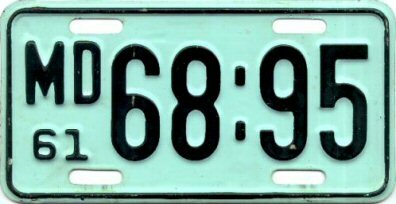 These plates were valid through March 1971 without stickers, and through March 1975 with stickers. Stickers were the same as those used on all other plate types. 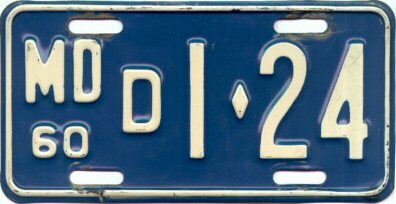 All plates in this period, regardless of when actually issued, contained the embossed 71 in the lower left corner. Serial formats were initially 0000, x000, and 000x, as used in previous years. However, this being a five-year plate, all of these formats were eventually exhausted. Subsequent formats used on this base were xx00, followed by 00000.. Lead zeroes were not used on the all-numeric plates, but were used on the alpha-numeric plates. 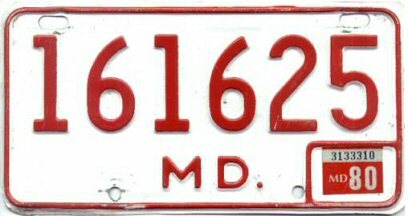 Undated red-on-white motorcycle base plates were issued as a general replacement in March 1975 and were valid through March 1976 without stickers, and through March 1980 with stickers. The base plate was of the same format as the previous base, except that it did not have an embossed year. Non-motorcycle plates had the state name and sticker box relocated to the top of the plate, but these elements remained on the bottom of motorcycle plates in order to not interfere with the bolt slots. Serial formats were initially 00000, then 000000, with no lead zeroes used. Stickers were the same as used on other plate types. 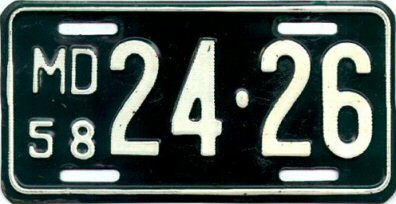 State-owned motorcycles not used by law enforcement agencies were issued regular motorcycle plates, since there was no state government motorcycle plate type at the time. 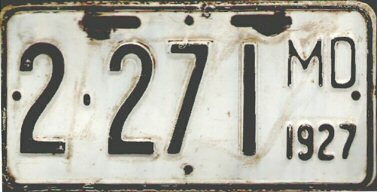 Plate number 42170 shown above is one such plate; see its registration card. 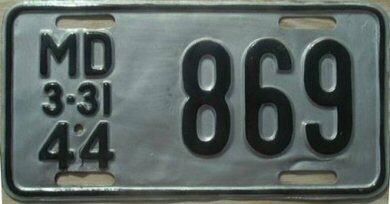 Undated, painted black-on-white motorcycle base plates were issued as a general replacement in March 1980. 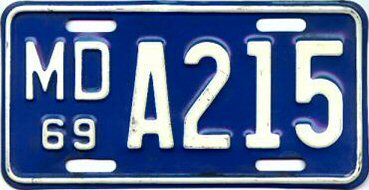 The plate design and the serial formats used were unchanged from the red-on-white base. 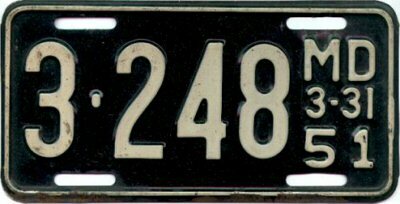 Unlike other types of plates, motorcycle plates continued to have fully-embossed sticker box borders, and the sticker box and the embossed state abbreviation continued to be located at the bottom of the plate. This base was valid through March 1981 without stickers. Stickers were applied for each annual registration period, through the period ending March 1986. The last natural of this base was issued in January 1986 with a (March) 1986 annual expiration sticker. During 1986-1987, motorcycles went through the same conversion to staggered expirations as did other vehicle types. 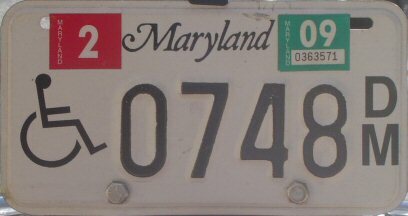 Plates expiring in March 1986 were renewed for one more registration period, which ended sometime between October 1986 and September 1987, based on the owner's last name. 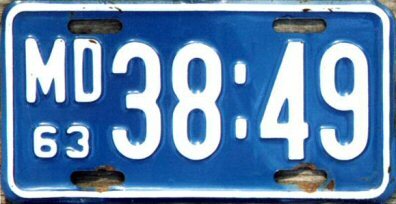 For staggered registrations, month stickers were placed in the lower left corner of the plate. Month and year stickers were the same as were used on other types of vehicles. Two 1976-base motorcycle dealers with different spacing (1977: Harbold plate); 1987 motorcycle dealer (Sallmen photo / plate); 1982 historic motorcycle; 1987 historic motorcycle vanity (Hennessey photo / plate); circa 1983-1984 State Police motorcycle; 1976-base four-digit motorcycle dealer sample (Harbold plate). Motorcycle dealers used the same base plates and stickers as regular motorcycles. 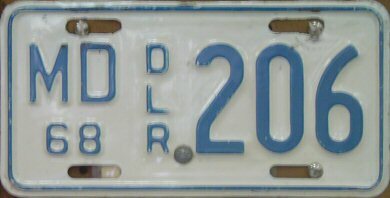 However, motorcycle dealer plates contained a small, embossed, horizontal legend DLR on the left body of the plate, followed by a serial number in formats 000 or 0000. 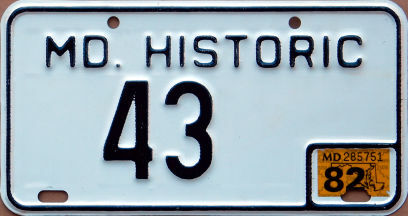 Historic motorcycle plates were introduced some time after the debut of the 1981 base in March 1980. 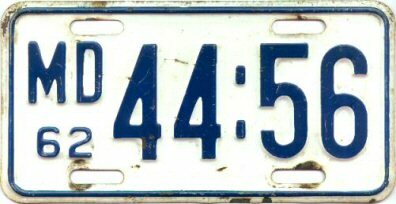 Sequentially-numbered historic motorcycle plates, at least, were in use no later than February 1982, probably earlier. These are funky-looking plates. They have MD. HISTORIC embossed along the top of the plate, and also have the usual embossed sticker box in the lower-right corner. In order for the serial number to fit, it had to be placed to the left of the sticker box. Two- and three-digit numeric serial numbers have been observed. Many, if not all of the sequentially-nuumbered plates, including the one shown above, were made incorrectly, with the bolt attachment points upside-down from where they should be. The round bolt holes were supposed to be at the bottom and further in where they wouldn't interefere with the sticker, and the longer bolt slots were supposed to be at the top. These were made available beginning with the 1981 base plate. Up to six characters were permitted. Serials were limited to four characters, due to the MD. HISTORIC legend across the top and the sticker box at the bottom right. Only issued on the 1981 base. 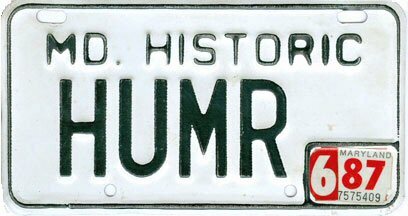 I don't know whether historic motorcycle vanity plates came out at the same time as sequential historic motorcycle plates, or later. I know, I said I wasn't covering law enforcement motorcycle plates on this page, but there's nothing on this plate to indicate that it even is a police plate. 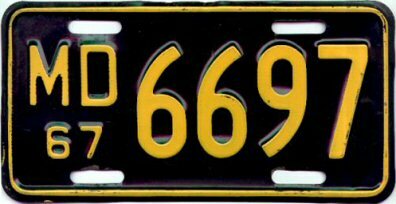 Same plate design as standard 1976-1987 motorcycle plates, but colored black-on-yellow , and with very low serial numbers. Likely these were issued and used only about 1983-1984. The sticker box was never used. I don't have any details regarding sample motorcycle plates from this era. 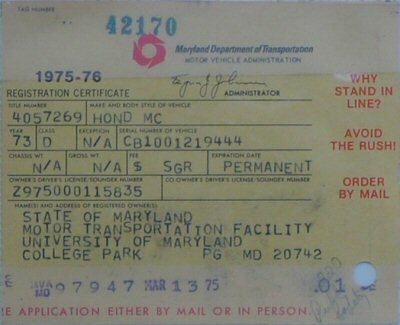 The 1976-base motorcycle dealer sample plate shown above probably was not available to the general public, but rather was intended for internal use by the the Maryland MVA. Motorcycle plates were modified to correspond with the black-on-reflective-white plates being issued to other vehicle types. They also received the script, fully spelled state name screened at the top of the plate. 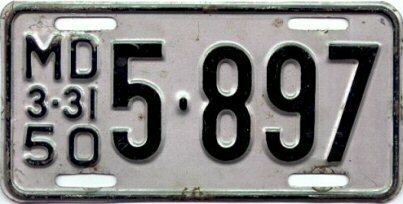 This base was issued to new registrants beginning in February 1986, and as a general replacement plate during the period October 1986 to September 1987. 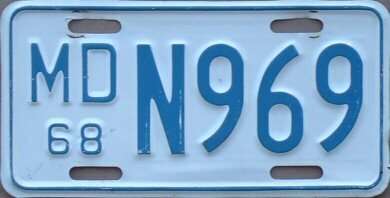 Probably a very small number of these plates were issued with 1986 expirations, but the overwhelming majority would have first expired in 1987 or later. Mandatory two-year registration periods for motorcycles owned by individuals were phased in between July 1992 and June 1994. On this base, all-numeric serial numbers were inexplicably given to trucks rather than motorcycles. 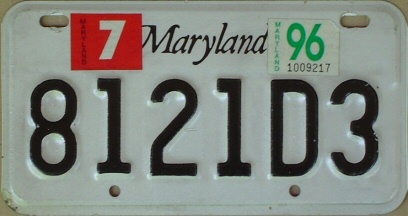 Motorcycle serial formats were therefore initially 00000D, with the "D" indicating Maryland's vehicle class code for motorcycles. Lead zeroes are used. This initial format was quickly exhausted, since only five characters were variable, and formats 0000D0 and 000D00 followed and were also exhausted. Serial format 00D000 would have been the obvious next format, but it could not be used because it also conflicted with truck serial numbers. So, for reasons known only to the Maryland MVA, format 000M00 was begun instead. I imagine that the "M" is supposed to stand for "motorcycle", but it also makes motorcycle serial numbers very similar to Class M multi-purpose vehicle serial numbers with format 000M000. Both month and year stickers are the same as used on passenger vehicles. 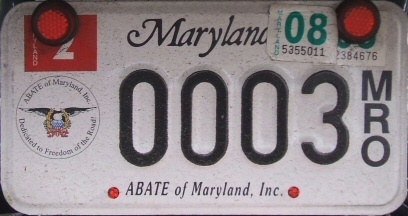 There are no sticker boxes or sticker wells; unfortunately, there is no place on this plate that the stickers will really fit without trimming them down, or covering all or part of either the screened "Maryland", the serial number, or the bolt slots at the top of the plate. As you can see from the examples above, the vertical position of the serial characters was changed over time, but it didn't make much difference. Therefore, registrants have placed their stickers in varying and creative locations on this base plate. 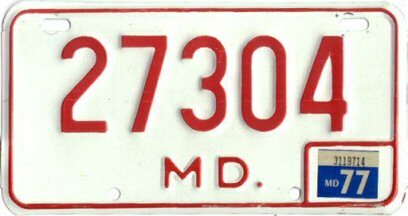 Maryland motorcycle plate dimensions continued to be 4 1/2 inches high and 8 1/2 inches wide, even as every other state in the U.S. gradually adopted a standard 4 inch by 7 inch size. The top bolt slots are each 3/8 inch long, and are 6 1/4 inches apart on center. The bottom bolt holes are round and are 3 3/4 inches apart on center. The vertical distance between the top bolt slots and the bottom bolt holes is 3 1/2 inches on center. Serial number characters are two inches high and one inch wide. This version was discontinued in 2005, but continues to be valid if renewed. 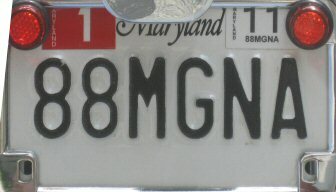 Beginning some time in 2005, the state's web address www.maryland.gov was added to the bottom edge of regular motorcycle plates. This is reported to have occurred at approximately serial number 740M00. The web address uses such a small font that it's unreadable except at a very close distance, making it rather pointless. Otherwise, these plates were unchanged from the previous version without the web address. About July 2006, serial format 000M00 was also used up, and the familiar "D" was brought back in new format 0D0000. 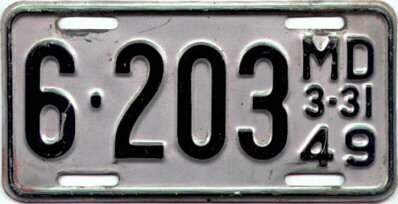 This version was issued for about three years or so, from 2005 to 2008, with the highest observed plate number being 7D0003. Although no longer issued, this version can also still be renewed. 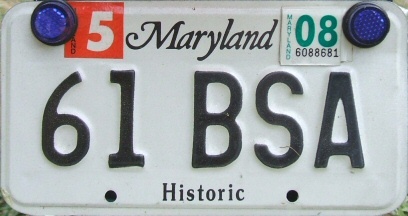 Beginning in October 2008, Maryland finally began issuing motorcycle plates with the same 4 inch by 7 inch dimensions and the same bolt hole positions as the other 49 states and the District of Columbia. This obviously required the use of smaller serial dies, but I haven't yet seen one of these up close to measure them. However, one can readily see that the number "6" die was made in a different font than that of the old, larger dies; the number "9" was similarly affected. The switch to the smaller dimensions happened somewhere between plate numbers 7D0004 and 8D8444, which is the lowest number reported so far on this base. About March 2009, the 0D0000 serial format was also exhausted, and next issued was format D00000. This version was issued through the first half of June 2010, with the high number reported thus far being D35831. This version can also still be renewed. 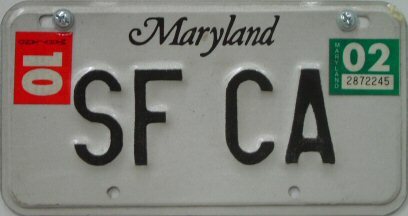 On Flag Day, June 14, 2010, a new standard base plate was introduced for several personal vehicle plate types, including motorcycles. This new plate commemorates the Battle of Baltimore at Fort McHenry, during which the Star Spangled Banner was written. The plate features blue serial characters, and red and blue graphics, on a white background. Motorcycle plates use the "small flag" version of the graphics, also used on full-sized handicapped and vanity plates. The motorcycle plates on this base continued the previous base's serial format D00000, picking up somewhere between D35832 and D39120. Upon plate number D99999 being issued in the summer of 2012, the motorcycle serial fromat became 00000Y. 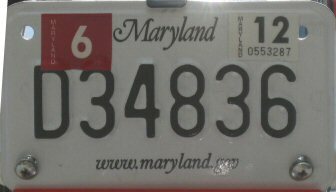 The "Y" doesn't stand for anything; the Maryland MVA seems to have abandoned its long practice of incorporating the vehicle class code into the the plate number on non-passenger plates. This version was discontinued in September 2016, but continues to be valid if renewed. 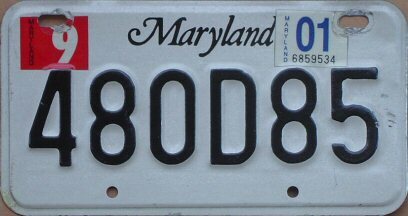 Beginning Monday, September 26, 2016, Maryland began issuing what they call the "Maryland Proud" plate design to new registrants of motorcycles and all other vehicle types and plate types that had been previously issued War of 1812 plates. 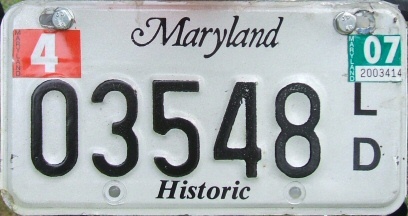 "Maryland Proud" plates consist of black characters on a white background, with a graphic of the state flag along the bottom edge of the plates. The state name uses the same font as the previous black-on-white plates, but colored red and outlined in black, rather than being solid black. Numbering for all plate types picked up from where it had ended on the War of 1812 plate design. Regular motorcycle plate numbering on this base began somewhere in the mid 90000Y series. 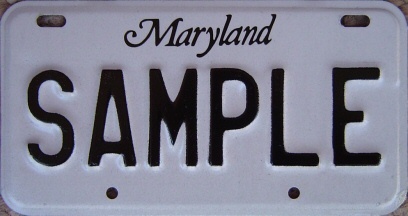 Standard passenger car plates, and also vanity and/or handicapped plates in both standard-sized and motorcycle-sized versions, are also produced on the "Maryland Proud" base. Other vehicle classes continue to be issued the old-design black-on-white plates. 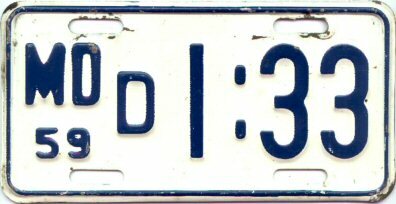 In December 2016, the 00000Y motorcycle numbering format was exhausted, and subsequent motorcycle plates are being issued in numbering format 000Y00. .
Special motorcycle plate types in the old 4 1/2" by 8 1/2" size: Motorcycle handicapped plate (plate in actual use); three standard historic motorcycle plates and two vanity historic motorcycle plates, with four different plate type legends between them (all are plates in actual use; first two standard plates and both vanity plates are Sallmen photos); five organizational motorcycle plates, for members of the Harley Owners Group Baltimore Chapter (plate in actual use), Maryland State Firemen's Association (plate in actual use), Harley Owners Group Fort Washington Chapter (Pang photo of plate in actual use), ABATE of Maryland (Sallmen photo of plate in actual use), and the International Association of Fire Firghters (plate in actual use), respectively; two sample motorcycle plates, versions 3 and 4; motorcycle vanity plate (Bodie plate). Special motorcycle plate types in the 4 inch by 7 inch size issued since the fall of 2008: Historic motorcycle plate and vanity motorcycle plate (both Ellis photos of plates in actual use); motorcycle handicapped plate (plate in actual use). All special types of motorcyle plates were issued in the old 4 1/2 inch by 8 1/2 inch dimensions at least until the fall of 2008. It's possible that some types were issued in this size longer than that, using up existing stock. However, all motorcycle plate types are now being issued in the new 4 inch by 7 inch size. 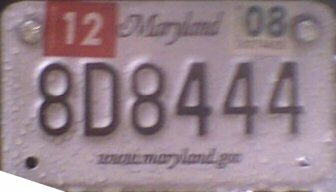 Handicapped motorcycle plates, vanity motorcycle plates, and handicapped vanity motorcycle plates were issued on the War of 1812 base between June 14, 2010 and September 25, 2016, and have been issued on the "Maryland Proud" base since September 26, 2016. Other types continue to be issued on the black-on-white base. 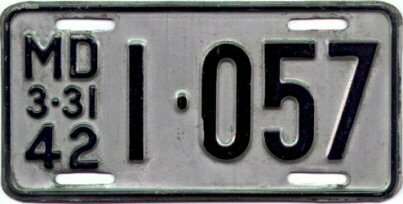 These plates are similar to regular motorcycle plates, but have a screened legend M/C Dealer or just Dealer at the bottom edge, and serial numbers in the format 1B0000. This is a fairly obscure plate type, as most people qualifying for handicapped plates probably are not physically able to ride a motorcycle. In any event, for those who are, the black-on-white plates they were issued displayed the familiar wheelchair graphic to the far left, followed by serial format 0000D/M. The wheelchair and the suffix letters were both screened, while the numeric serial digits were embossed. I don't know what the significance of the letters "DM" is; perhaps "disabled motorcyclist"? Numbering continued uninterrupted on the War of 1812 base, and I presume also on the "Maryland Proud" base on which they're now being issued. Motorcycles over 20 years old in basically stock condition are eligible for historic motorycycle plates. These are somewhat similar plates to those of regular motorcycles, but with a screened Historic or Historic M/C legend at the bottom of the plate, and bearing serial format 00000L/D. The numeric digits are embosssed, while the suffix letters are screened. The letters signify that the vehicle has a Class L (historic vehicle), subclass D (motorcycle) registration. The switch to the new smaller 4 inch by 7 inch size occurred somewhere between serials 17136L/D and 18414L/D. Heavily modified motorcycles over 25 years old may be registered as streed rod motorcycles. Their plates are very similar to a historic motorcycle plates, but instead have the screened legend Street Rod at the bottom edge. Serial format is 00000N/D. These letters indicate a Class N (street rod), subclass D (motorcycle) registration. I've personally seen only one of these in use, but was unable to get a photo. The plate was in the older 4 1/2 by 8 1/2 inch size, bearing serial 01451N/D. Up to six characters are permitted. 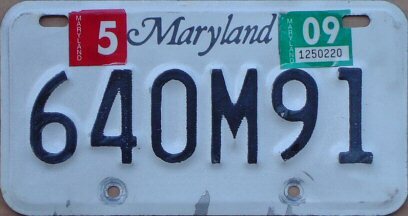 Vanity plates on the black-on-white base were apparently only briefly issued with the www.maryland.gov legend at the bottom in 2005; after that, the legend was once again omitted on new issues. Perhaps the state thought including the web address somehow constituted a state endorsement of the message the vanity plate conveyed. 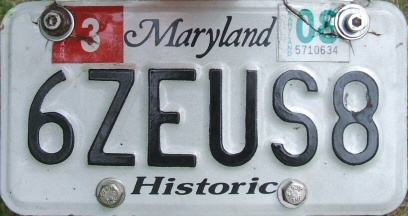 The 4" by 7" vanity plate shown above would have been issued between late 2008 and June 2010, and it doesn't have a web site legend, either. 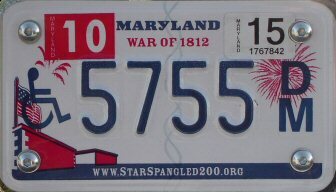 Vanity plates were made on the War of 1812 base and are now being made on the "Maryland Proud" base. 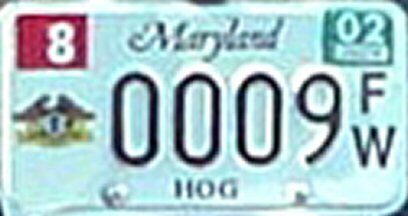 These do exist, according to the Maryland MVA, but I've never seen one. I would imagine that they're limited to four or five serial characters. 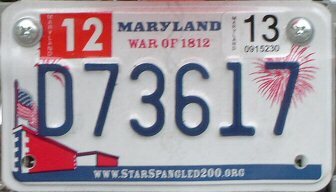 These were issued on the black-on-white base and the War of 1812 base, and are now being issued on the "Maryland Proud" base. Up to six characters are permitted on this base; the legend screend at the bottom can be either Historic or Historic M/C, just like on sequentially-numbered historic motorcycle plates. I've never seen one of these, but they're reported to be available. I'm sure they would also have up to six characters, and would have the legend Street Rod along the bottom edge. 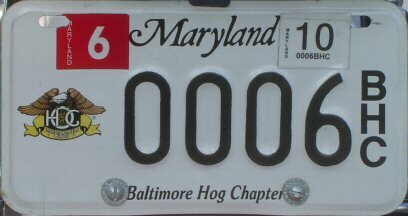 A number of groups have arranged for Maryland to issue organizational motorcycle plates to their members. These plates have a screened image of the organization's logo on the left side of the plate, and the organization's name screened at the bottom edge of the plate. Serial numbers are in the formats 0000x/x or 0000x/x/x, with the stacked letters unique to each organization. These same organizational letter codes are used as serial prefix letters on corresponding full-sized organizational member plates. 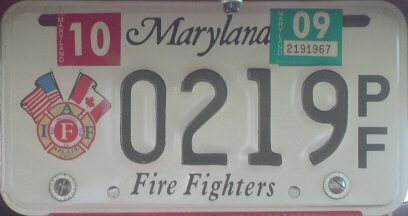 Known organizations with motorcycle plates include the various chapters of the Harley Owners Group (each with their own suffix), various other motorcycle clubs, the state organization and various locals of the International Association of Fire Fighters union (again, each with their own suffix), the Maryland State Firemen's Association, the state lodge of the Fraternal Order of Police, the Sons of Confederate Veterans, and the Vietnams Veterans of America. There very likely are, or will soon be, other such groups as well. For a long time, I wasn't sure that these even existed. I had only seen an online image of one, and it wasn't even mounted on a vehicle. I was suspicious that the photo had been tampered with. 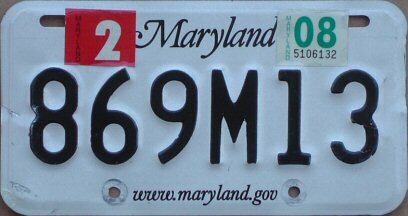 However, I've since seen a reference to these plates on an obscure page on the official Maryland MVA web site. Such plates would be probably only be used for state government-owned motorcycles not used for law enforcement. 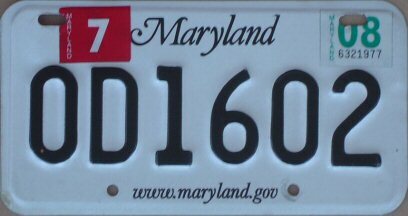 There was no mention on the MVA web site of there being any equivalent local government motorcycle plate. In any case, the image that I saw online showed a normal, reflective black-on white background. 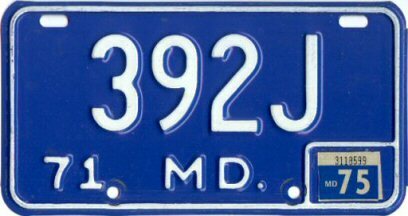 What was unique about it was the screened Maryland shield graphic, common on various full-sized plate types, but which otherwise has never been used on motorcycle plates. The serial number consists of a stacked S/G to the left of the shield, and a three-digit number to the right of the sheild. 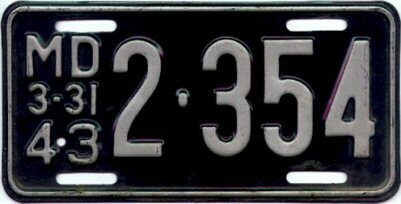 Sample motorcycle plates on the reflective black-on-white base have been observed with actual serial numbers 00000D, 0000D0, 000D00, and SAMPLE, all in the older 4 1/2 inch by 8 1/2 inch size, and all without a state web site legend. 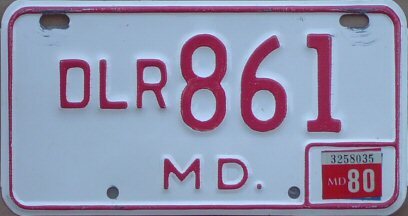 A small (6" by 3") white-on-red 1920 Maryland plate with serial number 8-609 and the legend Solid Tire at the bottom is not a motorcycle license plate. 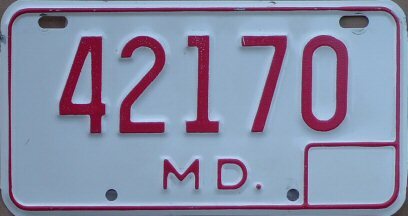 Maryland never issued solid tire motorcycle plates. 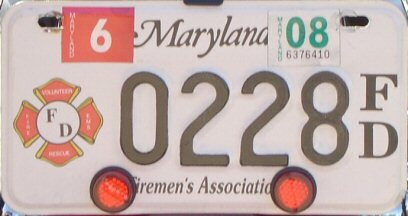 Rather, it's a miniature replica of a full-sized Maryland license plate issued to a solid tire vehicle. Usually, solid tire vehicles were trucks. 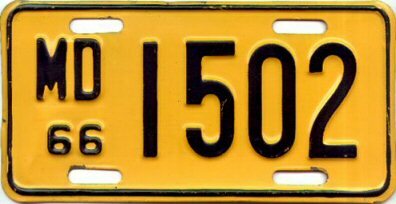 It's been reported that a license plate collector in the 1960s had these replica plates made, and he gave them to acquaintences to promote his collecting interests. 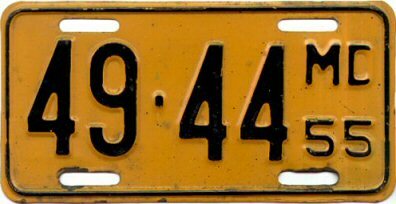 A small (5" by 2 1/4") yellow-on-black 1954 Maryland plate with serial number LG-19-53. 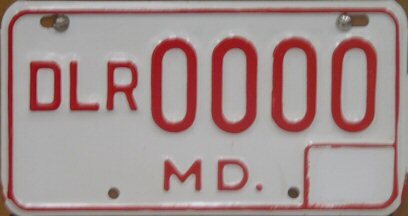 A small (5" by 2 1/4") black-on-orange 1955 Maryland plate with serial number MG-10-01. 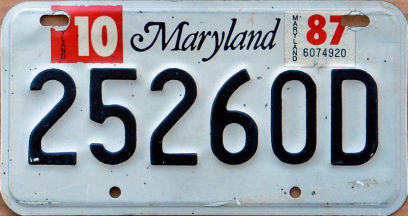 A small (probably also 5" by 2 1/4") white-on-blue Maryland plate bearing expiration date 3-31-60 and serial number AM-19-27. Thanks to those who have directly contributed to the information on this page: Dave Hennessey, Andrew Pang, Tom Smith, John Witt, Jeff Ellis, Ronald Henry, Dave Hennessey, John Willard, and especially "Tiger" Joe Sallmen. Pang photograph © copyrighted by Andrew Pang. All rights reserved. Used with permission. Sallmen, Smith, Witt, Ellis, Henry, and Hennessey photographs are presumed to be copyrighted by "Tiger" Joe Sallmen, Tom Smith, John Witt, Jeff Ellis, Ronald Henry, and Dave Hennessey, respectively, and are used with permission. Villani, Francis, Harbold, Bodie, and Willard plates are from the collections of John Villani, Jeff Francis, Harold Harbold, Lou Bodie, and John Willard, respectively. All text and photographs © copyright 2005-2019 by Rick Kretschmer, except where noted. All rights reserved.